San Francisco based Technorati has acquired AdEngage, a twelve person advertising network based in Los Angeles, in an all stock transaction. The AdEngage platform will remain a free standing, branded service, and Technorati will also launch a version of the platform under its new Technorati Media brand. The size of the transaction is not being disclosed. This follows Technorati’s August acquisition of BlogCritics, a network of blog content. AdEngage, which was founded in 2004, sells advertising for 4,000 sites, and has 13 billion ad impressions per month, says Technorati CEO Richard Jalichandra. Many of those sites are adult oriented, so Technorati isn’t merging it with its core service. Instead, they’ll launch a separate version of it under the Technorati Media brand in a few weeks. The screen shot below shows what the current, password protected version of the site looks like. For now the network sells self-service text and pho-text (thumbnail with text) ads on a cost-per-week basis. Soon other advertising types will be added (125×125 display ads to start), as well as CPC and CPM payment options. 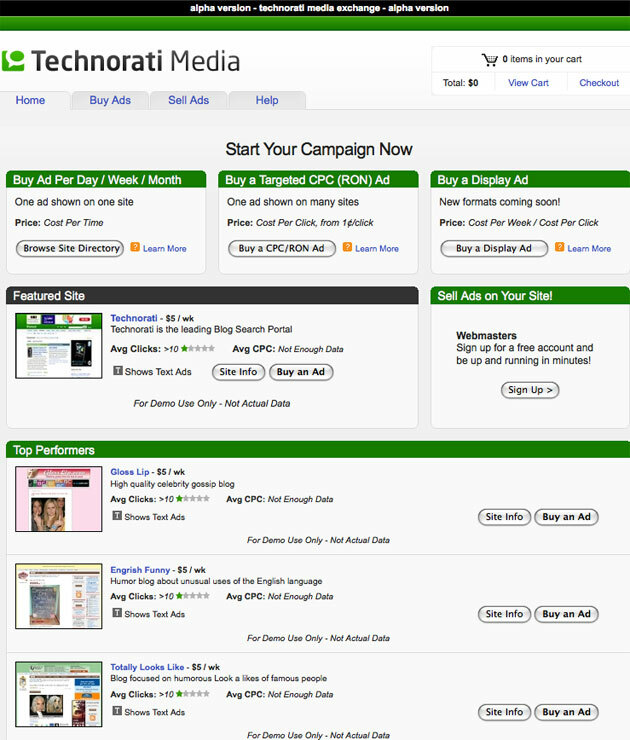 The current Technorati Media offering is for larger sites that Technorati partners with. When the AdEngage platform launches smaller blogs can sign up as well, and hopefully command relatively higher advertising rates by grouping with similar blogs in “spheres of influence,” as Jalichandra puts it, based on tagging and linking behavior.